News / Planning / The Wave Footscray - yes please! The Wave Footscray - yes please! The Footscray development scene is at present an interesting beast. Full of promise and potential yet short on results, Footscray - one would think - will eventually mirror South Yarra in fully embracing to the high-rise model. Indeed just like South Yarra's successful Forrest Hill Precinct, Footscray has the Joseph Road Precinct which in due course will host dozens of apartment towers (a number of which have been approved to 30 levels), eventually making an indelible mark upon Melbourne's skyline. 8 Hopkins Street, 10 Moreland Street and 1 Warde Street are just a sample of what is in store for the Joseph Road Precinct, yet to date little has materialised by way of construction. Sites 8 Hopkins Street with potentially 795 apartments and 18 Hopkins Street which carries approval for 1000 apartments have yet to gain buyers even though both sites have been on the market for some time, while other projects have seemingly vanished post approval. Hopkins Street precinct is not alone with multiple other sites congregating around the soon to be completed Footscray Station revamp gearing up for a high-rise rebirth, although only two major projects are currently under construction at 18 Albert Street and 1 Mc Nab Avenue. If only a true 'gateway' site were available and consequently developed that would announce to one and all the worth of Footscray in a design sense, while also heralding a new high-rise chapter for the locality. Well that site exists at 69-73 Hopkins Street with the scheme above which seeing a large residential building covering the triangular 2241 square metre site, currently the home of Footscray Market. Consider the parcel of land most capable of holding a tall skyscraper and fronting Footscray Station plus Footscray's main intersection if traveling by road from Melbourne's CBD, the site fits the bill. In the past 69-73 Hopkins Street has been subject to an expressions of interest campaign with the above design paraded as part of the marketing material. Also visible on construction firm Multifield Group's webpage, the 29 level twisting design gives a fair indication as to what can be expected at some point down the track, yet with its hopelessly inactive podium and heavy use of precast panels it's not quite the stupendous statement worthy of such a site. 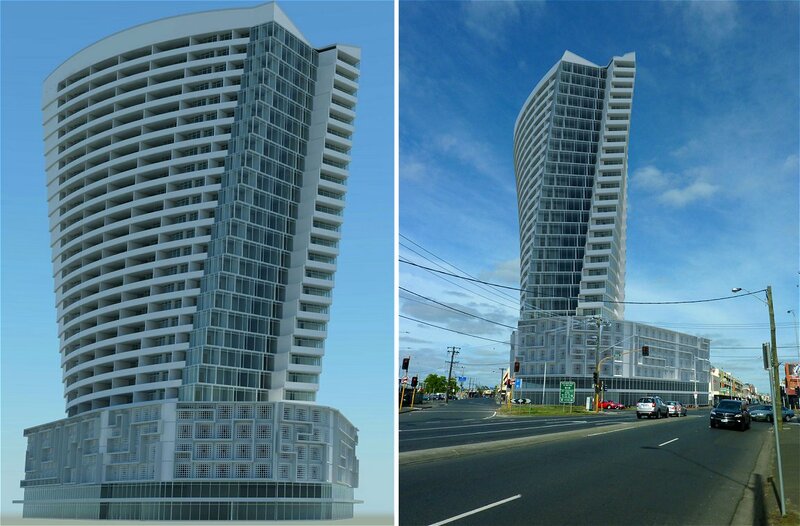 Enter a sinuous and stunning concept named The Wave Footscray. Very little is known about the scheme - released late 2012 and potentially nothing more than an expression of the creators skill, it matters little for The Wave is precisely the quality of functional design that should be encouraged for this particular site. Characterised by sweeping curves and outdoor terraces, the lower floors and podium rooftop near mimic Vivo City Singapore in both aesthetics and function, with the inclusion of a water feature and treed landscapes. While the podium would house a rejuvenated Footscray Market, the tower would carry retail space, parking facilities, a gym and commercial space. With a rooftop green area and LED lighting the complex covers the basics - immaculate design, heavy activation to all frontages, multiple uses attracting a varied custom and green initiatives. Team The Wave Footscray with Point Architects' concept for a green apartment tower abutting the The Wave at Irving Street and Leeds Street and that would make for an impressive one-two design punch! In due course many apartment buildings and commercial towers will appear throughout Footscray with vast numbers of new residents and workers to follow, my only wish is that a high calibre project such as The Wave Footscray would lead the charge. Rather than wax lyrical, see the following video clip. …And if Footscray doesn't want this building, let's build it on one of the corners opposite the Haymarket roundabout. OMG! Being a resident I always had faith that development would be positive for Footscray, but never in my wildest dreams did I expect anything like this! If only we could finally turn soil on one of them ie Wave/Binks Ford Site/Josephs Rd it would get the ball rolling on others. For all the plans of the last few years - there are 13 projects in the UM database for Footscray (plus Wave, Ryco and Kinnears), frustratingly only 2 are under construction - McNab Ave (State Trustees) and the Footscray Plaza development. Hopefully Santa brings me a brand new shovel from Bunnings and I'll just go down there and start construction myself! If this gets up, along the proposal for the Binks Ford site across the road, it woud be a truly stunning gateway to Footscray. I'm putting my name down for an apartment as soon EOI's are open! BTW, the green apartment tower is actually on the corner of Irving St and Trugo Lane, about a block down, currently home to a car park. Irving St is the new Chapel St! Brilliant design. Now that's what I call architecture. Well, the Starbucks in the video definitely suggests this development could turn Footscray into South Yarra. If only, only in a perfect world would Footscray see quality as good as "The Wave" get built in Footscray . Its seems like only the blandest of the bland gets up here. Ive been waiting for years for some real action to start on building and all we have got is a government funded State Trusties . Wow! I just googled 'the wave footscray' by accident and look what I find here! Amazing feeling! Never thought about this privately created uni-level feasibility proposal being discussed in public. Especially it's been more than a year since the finish design of the WAVE. It's very interesting that the Multifield Constructions has a similiar design in March 2010(in terms of the relaease date on the website), because we had never seen this before. Thx Mark!